Attention Retailers, Dealers, and Merchants! Sign up below to gain access to the EE Distribution New Client Application found on the following page. EE Distribution™, a division of Entertainment Earth®, is a wholesale distributor that welcomes you to a brand-new world of unique and hard-to-find products for your business. You'll have an easy one-stop shopping experience when you open a wholesale account with us, and with thousands of action figures, toys, gifts, and collectibles from hundreds of manufacturer lines to choose from, we can help you grow your business. We personalize our service to you! You can email [email protected] or call 1-818-255-0095 to speak with a highly trained representative who knows the collectibles marketplace and will work closely with you to know your clients' needs as well. EE Distribution is a wholesaler that understands that this is a partnership where our clients' success contributes to everyone's success. Contact us today to find out more about what we can do to help your company expand and prosper. We're open from 7:30 AM to 5:30 PM Pacific Time, Monday through Friday. Seekers of wholesale toy collectibles should browse the EE Distribution website and note the thousands of items currently available for resale, a huge selection that changes and grows with each passing day. Regardless of the various brands or licenses your clients demand, you're sure to find plenty of merchandise to satisfy their hunger. EE Distribution offers an extensive collection of toys, action figures, vinyl figures, collectible statues, prop replicas, television and film memorabilia, comic book figures, board games, dolls, gifts, sports collectibles, and much more. So, whatever target market or niche markets in the collectibles universe you pursue, we've got you covered. If you're looking for brand-name toys at discount prices, look no more! We carry a wide range of products from popular brands like Bif Bang Pow!, Hasbro, Mattel, Bandai, Mezco Toyz, DC Collectibles, Diamond Select, Banpresto, Loungefly, NECA, WETA Workshop, Kotobukiya, Gentle Giant, Fisher-Price, USAopoly, Storm Collectibles, Monogram, Bioworld, McFarlane Toys, Vandor, Square Enix, Super7, Eaglemoss, Beast Kingdom, and Darkhorse. You even get those adorable Funko Pop! Vinyl figures at a wholesale discount! You'll find extensive movie, TV, video game, anime/manga, music, and other memorabilia from Star Wars, Star Trek, Power Rangers, Transformers, Marvel (Avengers, X-Men, Guardians of the Galaxy, Spider-Man, Venom, Thor, etc. ), DC Comics (Batman, Wonder Woman, Superman, Supergirl, etc. ), Dragon Ball, Disney, The Nightmare Before Christmas, Masters of the Universe, Doctor Who, Predator, Pokémon, Mortal Kombat, Barbie, Living Dead Dolls, Universal Monsters, My Little Pony, The Big Bang Theory, Nintendo, Sailor Moon, One Piece, Super Mario Bros., The Legend of Zelda, and many more. Maybe your valued customers are shopping for the perfect gifts for family or friends for birthdays, anniversaries, graduations, holidays, or "just because," or maybe they're looking to add to their own private collections with some special something for themselves. Either way, this is where you and EE Distribution come together to meet their needs and wants. Our vast array of wholesale gift items is sure to fit the bill. EE Distribution helps businesses around the world grow through increased sales and margins, our high-volume small-package and freight rates, Amazon FBA servicing, and Hasbro distributor pricing. We also allow smaller retailers to purchase as little or as much of an item as they need. Thanks to our simple tools, online ordering with an easy-to-use password-protected website, and constant efforts to improve internal efficiency, EE Distribution anticipates and reacts to the changing demands of the marketplace and leads our clients into the future. 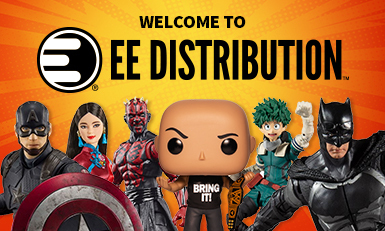 As a retailer, dealer, or other merchant in the field of reselling toys, action figures, gifts, and/or collectibles, you'll appreciate what EE Distribution has to offer in the way of volume discounts, no minimum order requirements, and exclusive products you can't find anywhere else. But we also provide outstanding client service. All our actions and efforts are geared toward keeping you happy, successful, and focused on growing your business and to making EE Distribution your one-stop source for all your product needs. Give us the chance to prove it. Open Your EE Distribution Wholesale Account Today!